My one-day lay off from the cycling has at least allowed me to catch up on the domestics, notably the washing but also a shave for the first time in the best part of a week. 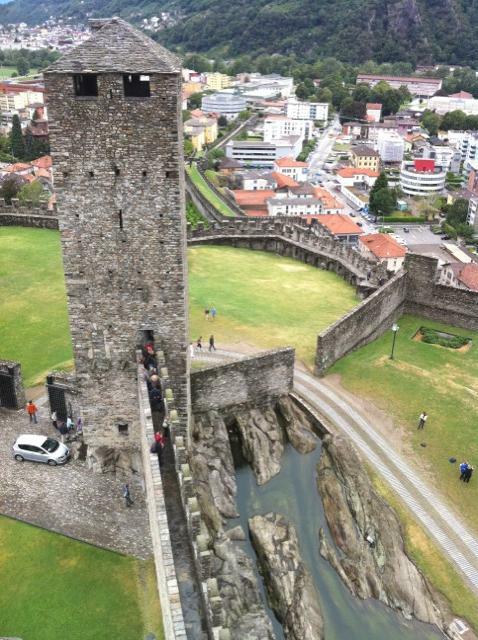 It has also given me the chance to explore the town of Bellinzona itself. It’s the capital of Ticino although I have to say I’d never heard of it until Claus Zimmerman pointed out that there was a campsite here. Even then I thought it was just a stopping off point en route down the valley. Well, thanks to Napoleon, it is more than just that. There is a small plaque outside the police station thanking him for making the town the administrative centre for this region. The main attractions apart from the well-maintained and attractive streets and squares are the three castles; Castelgrande, Castello di Montebello & Castello di Sasso Corbaro. The one you see in this picture is the first one. The others are on the side of the mountain behind me and formed a barrier across the valley. Mirroring the futility of the Maginot Line that I mentioned last week, this set of fortifications was ultimately just as useless as the Swiss won the town under the Treaty of Arona in 1803. Don’t worry, I didn’t spend all afternoon in the town’s archives, I’m just quoting from the guidebook. All three castles are as dark and foreboding as the weather was this morning and from the top of the tower, you get great views up and down the valley. I’m now in a bar en route back to the campsite. I have been feeling lethargic all day; nothing to do with the efforts of the last two days just the fact that when I looked out of my tent this morning and saw the soggy sight outside, I mentally switched off and have done everything today at half speed which I have to say is thoroughly relaxing. In a short while (think if a “short while” and double it for the “short while” I will be taking), I’ll finish my walk to the campsite and check over the tent. Now that the rain has stopped I am hopeful that it will once more be its wonderful dry self again. Henry Helium has taken the brunt of the elements in the last few days but he is surviving. A small leak in the roof thanks to a stupid design too intricate to explain here is his only problem. Well my problem when I get dripped upon. I will then try and answer all of your messages / comments that have been posted on here in the last couple of days. I haven’t successfully managed to get on a Wi-Fi connection since Lucerne but there is one at the current site which I will try to use later today. Check out your comments later this evening; I should have respoonded by then. And tomorrow I head for Como by following the final section of the Swiss route 3. Simone: thanks for your messages – I will be on touch but it’s looking like Saturday is the day I will be heading south from Como….